Acoustics and technology have become larger and more important components of new and renovated education facilities. Our acoustical designs routinely meet or exceed all provisions of the ANSI S12.60-2002 guidelines for classroom acoustics, and routinely meet or exceed LEED prerequisites in a cost effective manner. Our goal is to provide facilities that allow educators to teach, and students to learn, without struggling with the spaces they occupy. K2 understands that each client has specific, program-driven requirements that do not always fit a “one-size-fits-all” approach. 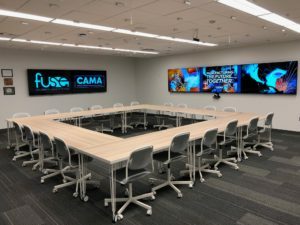 Whether the goal is an immersive, content-focused, video experience or a highly integrated campus-wide audio/video system, our ability to use the latest technologies and create customized software and programming solutions makes us unique in the AV consulting industry. We also provide theatrical lighting and rigging design services for performance spaces. Our designs are always crafted with the end user in mind, and provide user controls that are easy to navigate, especially when student users are involved.